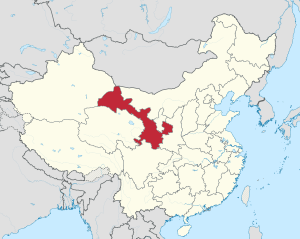 Gansu (simplified Chinese: 甘肃; traditional Chinese: 甘肅; Wade–Giles: Kan-su, Kansu, Kan-suh) is a province of the People's Republic of China. The capital is Lanzhou, in the southeast part of the province. These rammed earth ruins of a granary in Hecang Fortress (Chinese: 河仓城； Pinyin: Hécāngchéng), located ~11 km (7 miles) northeast of the Western-Han-era Yumen Pass, were built during the Western Han (202 BC - 9 AD) and significantly rebuilt during the Western Jin (280-316 AD). Gansu Facts for Kids. Kiddle Encyclopedia.